Our latest iPhone/iPod touch game is already available on the iPhone AppStore. 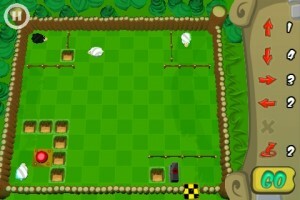 Black Sheep, a brainteasing sheep puzzle game with 40+ levels, has been released. Help the black sheep to escape from its feed lot by placing modifiers on the playground that guide the sheep through the levels, over obstacles and other curious stuff. Tips on how to clear level 18?? Please?? I just sent you an email with the hint – have fun playing! Ik weet niet wel level het is.. Maar ik kom er niet uit. Rechts boven is de uitgang met 2 deuren en het zwarte schaapje staat er voor. Links maast hem staan 2 witte schapen die op de knop moeten drukken. Maar hoe?? The level with in the upperright corner the exit with 2 doors in the front of it. Black sheep is standing right beneath it, 2 white sheeps in Jos left side. I don’t know how to end this game? 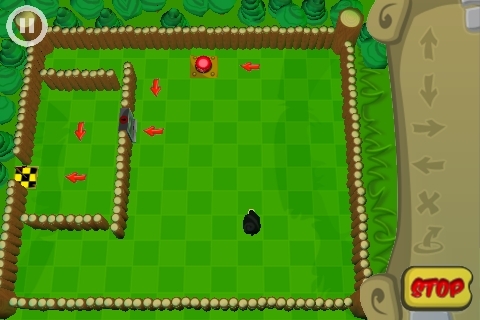 could you send in a screenshot of the level you are talking about? To do that, just hold the on/off button of your device and then press the home button – the image is then saved to your camera roll.